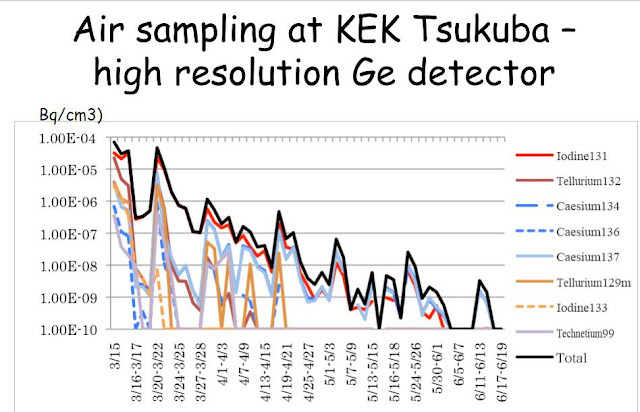 this chart from http://www.galcit.caltech.edu/~jeshep/fukushima/ShepherdFukushima30Sept2011.pdf Caltech professor shows how various elements declined. Various flavors of I-133 have half-lives from 21 hr to 9 s and 170 ns, which explains why it dropped off so fast. The good news is that the radiation really is declining. The bad news is that all the while it was declining, the fission was evidently continuing (at lower levels) and leaking just about everything all the time.